Britain’s World War-I army included Indian children as young as 10-years-old fighting against the Germans on the western front, according to a new book on the role of Indian soldiers in the Great War. The youngsters were shipped over to France from the far reaches of the British Empire to carry out support roles, but were so close to the front line that many were wounded and admitted to hospital, according to ‘For King and Another Country: Indian Soldiers on the Western Front 1914-18’. The account by writer and historian Shrabani Basu is based on official papers at the National Archives and British Library. Some of the Indian children, including a 10-year-old “bellows blower”, and two grooms, both 12, provided support to cavalry regiments, a ‘Sunday Times’ report said. 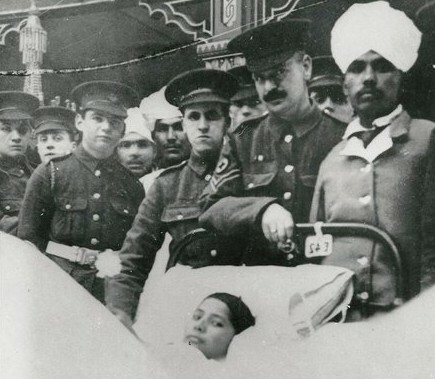 One of the youngest boys involved in direct combat was a “brave little Gurkha” called Pim, 16, who was given an award for valour by Queen Mary while he was recuperating in hospital in Brighton. Basu believes many of the children came from poor families and that they would have lied about their age at recruitment offices in India, where they were encouraged to sign up for a monthly salary of 11 rupees. “In the case of a 10-year-old, it should have been pretty obvious that they were underage,” she told the newspaper. This embarrassment was shared by some British officials. In one dispatch to Lord Kitchener, secretary of state for war, Sir Walter Lawrence, a civil servant tasked with overseeing injured Indian troops, wrote: “It seems a great pity that children should have been allowed to come to Europe.” About 1.5 million Indian soldiers fought for Britain in the First World War, with a handful being awarded the Victoria Cross bravery medal. Basu’s book also reveals that British nurses were barred from treating Indian soldiers in war hospitals and were allowed only to supervise orderlies, leading to claims of discrimination.